토요일 일정이 끝난 이후오후 7시부터 진행된 국제 포럼 및 파티는 PIA에서 강의를 맡아준 국제 강사와 한국, 일본, 중국에서 참여한 강의자등과 컨벤션 참가자들이 한 자리에서 미팅할 수 있는 값진 시간이었습니다. 지금까지 컨벤션에서 강의를 통해서 지식의 전달만 하고 지도강사의 생각과 전달하고자 하는 메시지등을 접할 수 없었던 한국의 필라테스 피플들에게 레젼드 강사와의 만남과 대담은 큰 의미였다는 평가였습니다. 참가자들이 궁금해왔던 부분들을 원하는 강사들에게 지목하여 질문하기도 하였으며 질문에 답변을 자유롭게 하는 형식으로 아시아 최초로 포발전포럼과 대담의 시간을 가졌습니다. 이어서 일본 대표의 PIA 참가 의미와 일본의 필라테스의 현주소에 대한 소개와 중국에서 가장 활발한 활동을 하고 있는 리신으로부터 중국의 필라테스에 대한 소개를 들었습니다. 마지막으로 세계적인 필라테스 교육 단체인 폴스타 필라테스의 브렌트 엔더슨이 포럼강의로 귀중한 시간을 마감하였습니다. 매년 이어지는 PIA에서 이러한 학술 포럼과 미팅의 자리는 좀 더 체계적으로 규모있게 진행될 것이며 필라테스가 한국 및 아시아 지역에서 정착되고 발전되는 초석이 될 것으로 믿습니다. 다시 한번 참석해준 많은 분들께 감사의 말씀을 드리고 싶습니다. After lectures of Saturday, we had APA forum and Party with international presenters, korean presenters, and students from asian region. It was meaningful to have such event that people can share their opinion with international presenters who are mostly living legend of Pilates other than lectures. Dr. Jang, the host of PIA first introduced himself and gave greetings and then international presenters did the same. Students had a chance to ask a question to the presenters freely. It was the first time to have such forum in asia. After, our japanese presenter introduced the situation of japanese Pilates industry and meaning of participation of PIA. Lixin, our chinese presenter who is actively working in the scene also introduced the situation of chinese Pilates industry. Then, Mary Bowen, the living students of Joseph Pilates, gave an address on the philosophy of Joseph. Brent Anderson, the founder of well-know pilates education group Polestar, delivered a lecture on the future of Pilates. 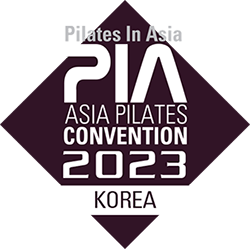 Academic forum and international meeting at PIA will develop more every year and it will become a foundation for the settlement of Pilates in asian region. Again, we would like to show our appreciation to those who were there to join us.